Our unique property, nestled in Oregon’s beautiful Rogue Valley, is designed in the tradition of a Victorian manse, lovingly referred to as the "castle." The goal is a long life, well spent. Studies have shown that 'planning' to grow old adds 7.5 years to one's lifespan - not just years, but healthy years. Are your kids trying to get you to move in with a bunch of old people? 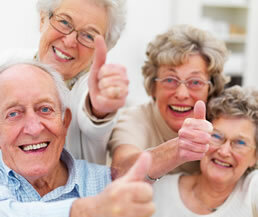 You may be surprised to find how few 'old people' reside at Alderwood. We understand and foster the difference between chronology and spirit! Expect engaging, humorous interactions with the 'well-seasoned teenagers' whose journeys we are so honored to share! Discover beautiful and secure living in a warm, friendly atmosphere that supports your personal needs and maintains your independent lifestyle. Explore our community of 60 comfortable private suites conveniently located close to shopping and medical facilities in a well established Central Point neighborhood. Choose from cozy studio or one-bedroom suites, all with private baths and kitchenettes.